This chapter evaluates the importance of the Dodge Line, which was implemented in early 1949 to stop hyperinflation. The Dodge Line returned the Japanese economy back to the world economy. The Dodge Line was characterized by a balanced budget that would last until the mid-1960s. This tight-money policy crushed all the ideal and “democratic” social security plans devised during the early period of the Allied occupation, but basically continued the prewar medical insurance programs with some revisions. 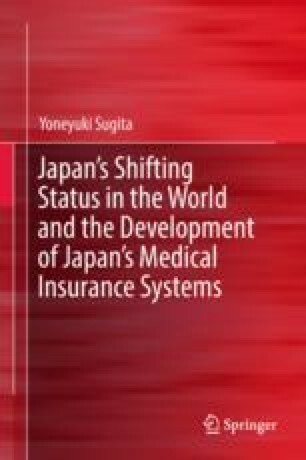 In this sense, the Dodge Line constituted a critical turning point in the development of post-World War II medical insurance in Japan. Koseisho Imukyoku. (Ed.). (1955). Isei 80nen shi [80-year history of the medical system] (p. 261). Tokyo: Insatsukyoku Choyokai. For the complete text of the Medical Service Law, see http://elaws.e-gov.go.jp/search/elawsSearch/elaws_search/lsg0500/detail?lawId=323AC0000000205&openerCode=1. Accessed May 10, 2018. Trade Statistics by the Finance Ministry. http://www.customs.go.jp/toukei/suii/html/nenbet.htm. Accessed May 10, 2018.